Possum Merino socks are made from sustainable, renewable fibres. Possum numbers in New Zealand continue to grow, and merino sheep continue to renew their fleeces. As well as wearing an environmentally sustainable product Possum fibre is 55% warmer than merino fibre, the combination produces a garment with a high warmth to weight ratio. 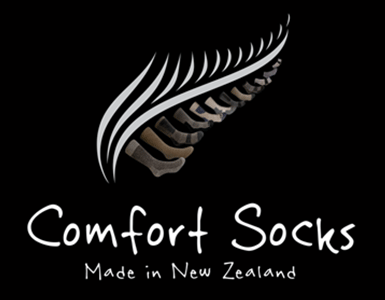 Comfort Socks put up to 40% possum in socks, making them light weight and suitable for wear both inside and out. The brushtail possum was introduced to New Zealand in the 1850s and this particular species of possum is now causing havoc on our natural wild life and native forests. The need to control the number of possums in New Zealand, in order to protect the native wildlife, flora, and fauna, saw the development of a specialised fibre within the knitwear industry of New Zealand. This fibre incorporated New Zealand Merino wool, and Possum fur, a combination that proved to be successful. A superior, high quality yarn was created, that also worked to successfully help the ecology of New Zealand by creating a demand for possum fibre. • The Possum fibre has no scales and is hollow, which gives both lightness and warmth, compared to other natural fibres of a similar micron. • Possum fur has a very silky handle to give instant feel appeal unlike any other. The texture of knitted possum fur is luxuriously soft, easy to wear and exceptionally comfortable. • Possum fur will not freeze, even when exposed to periods of prolonged cold. The only other fibre on the planet known to have the same characteristic is polar bear fur.